BACKGROUND: Rush Skeletonweed is a native of Eurasia. It generally prefers well-drained, light soils. The plant spreads primarily by seed, but roots scattered by cultivation can aid in spread. DESCRIPTION: Rush Skeletonweed is a perennial whose branched stems may be 4 feet tall and superficially appear leafless. Basal leaves form a dandelion-like rosette that withers as the flower stem develops. Stem leaves are narrow and up to 4 inches long. The lowest 4 to 6 inches of the stem is covered with coarse, brown hairs. Stems and leaves both produce a milky latex. Yellow flower heads are 3/4 inch in diameter and are scattered among the branches from mid-summer to fall. The seed is ribbed and bears a soft, white plume. DISTRIBUTION: Rush skeletonweed infests millions of acres in the Northwest and California, including these Idaho counties. CONTROL: Biological control agents (a stem/leaf rust, a bud gall mite, and a stem/leaf gall midge) are available, occasionally providing good control of rush skeletonweed. 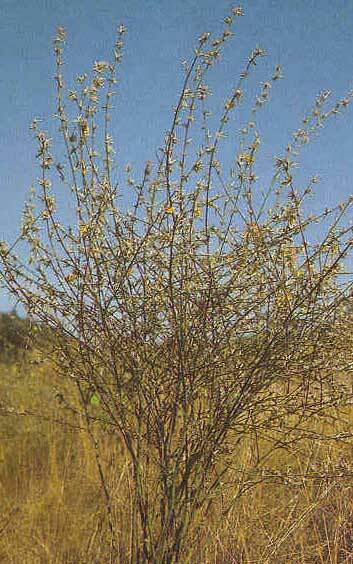 Herbicides, if applied consistently each year, can control this weed after 3 to 5 years.